Convenience checks are blank checks you get in the mail, and there’s a good reason you keep getting convenience checks from your credit card company: those checks make it easy to put large balances on your card. They often come from a credit card company that you have an existing account with, and they are linked to that account. Why is your card issuer so eager to help you spend? They stand to earn a lot in interest and fees when you step up your borrowing. If you make a payment or purchase with those checks, it’s (almost) as if you got a cash advance from your card to make that purchase. In short, they’re another way to spend using the line of credit available on your credit card. 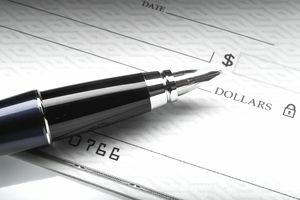 Those checks can be used for almost anything: you can write a check to yourself and cash it, you can transfer balances from another card, or you can buy goods or services from a business that accepts personal checks. In some cases, convenience checks come with an attractive offer. For example, you might pay 0% interest on balance transfers for 6 months – and that might be a good idea if you’ll pay off an existing high-interest-rate balance before the promotional period ends. However, those offers are generally only available if you have good credit, and you need to watch out for fees. Convenience, as you might imagine, comes at a price. Even if you get an attractive balance transfer offer, convenience checks can end up costing more than you expected. Cost: convenience checks are generally treated as “cash advances” (as opposed to purchases made when you swipe your card at the register). That means you’ll most likely have to pay a higher interest rate on the money you spend with a convenience check, which increases the total interest costs you’ll pay over the life of that loan. What’s more, you might have to pay a cash advance fee, which increases your loan balance (and therefore your interest charges). How balances are treated: you might think that all of the spending you do with your credit card is the same. In fact, your lender puts your spending into different “buckets.” For example, in-person purchases with your card fall into one category, and spending with convenience checks falls into another category. Balances aren’t always handled in your favor. In many cases, there’s no grace period on money you spend with a convenience check – so interest will start adding up immediately. Federal law requires lenders to apply payments above and beyond your minimum payment towards high-interest rate debts, but that doesn't do you any good unless you really pay extra. All good things come to an end: Convenience checks are most attractive when they allow you to borrow at 0% APR. But what happens after your “teaser” or promotional period ends? In many cases, you’ll start paying interest at typical credit card rates – which can lead to higher payments and increasing debt. Consumer protection: When you swipe your card (or type in your card number) to make a purchase, you get certain benefits. Your card issuer probably offers some sort of “buyer protection,” and federal law protects you as well (you can reverse the charges in certain situations). Those benefits don’t necessarily exist when you pay with convenience checks; if you buy faulty merchandise and can’t get a refund, your credit card company is unlikely to help you get your money back easily. Your credit: Convenience checks make it easy to spend a lot of money. As you increase your borrowing, your credit scores can suffer. In general, it’s best to keep your balance below 30% of your credit limit (for example, if your card has a limit of $1,000, you’d want to keep your “credit utilization” below $300). If you approach your credit limit, lenders and credit scoring models may assume you’re getting into trouble, and they’ll be unwilling to approve new loans for you. Getting cash: you can cash a convenience check anywhere you can cash a personal check. However, you might not get as much as you think. For starters, credit card cash advance limits are often lower than your credit limit for purchases – so check the details on your available credit. What’s more, banks might not give you the full amount of cash instantly; you might get $200 when you try to cash the check, while the rest will be deposited and held for several days. Convenience checks can certainly help you save money (and spend it easily). But they require some caution if you want to stay out of trouble: read the fine print and call your card issuer to understand exactly what you’re getting into. In most cases, it’s a good idea to just shred these checks as they come in: you’ll avoid temptation, and you’ll make it hard for dumpster-diving identity thieves to find a blank check.